People go online for a variety of reasons, including for entertainment and socializing. But the Internet is also used to find information and learn new things. Not sure how to use a new piece of software? There is probably a video tutorial on YouTube. Want to know what you can make for dinner with the three ingredients you have in your fridge? Check Pinterest for a recipe. This need for information and instruction has created a great opportunity for you to get paid for your knowledge. While some people have done this by creating a blog or writing books, an online course is another method of selling what you know. Online learning is expected to reach more than $240 billion by 2021, according to Global Industry Analysts. Many people don’t think they know enough of a topic to teach it, but the truth is, you don’t have to be an expert to create and sell an online course. You simply need to know more than most. Plus, the topics you can cover are vast including art or photography, personal development, music, gardening, cooking, marketing, technology, language, and more. Many people have made thousands of dollars a month with online courses teaching things like guitar, how to use specific software, or how to bake bread. New online course platforms make setting up and selling your course easier than ever. Tools and equipment needed to create a course are easier than ever to use. Course sales can be added to an existing business. For example, if you’re a blogger, you can offer a course that delves deeper into your topic. If you offer a service, you can provide a course for DIYers that don’t hire you. Offers a passive income stream. Once you create your course, you can sell it over and over. It can be part of a funnel system to lead students to your coaching program or other services. Because your course is online, you can have students from all over the world, in any time zone. Quality online courses offer a variety of content delivery methods such as text and video, which can take time to create. If you use a hosted service such as Udemy, you don’t “own” the market or the platform. Like all other money-making ventures, your success depends on the need or desire for your course, and your ability to attract your target market. It can be a challenge to price your course right to maximize your income, while still making it affordable for students. If you’re ready to delve into the world of online teaching, follow the steps below. Make a list of things you know about. Perhaps it’s something your friends and family ask you for help on. Maybe it’s a skill related to your job (i.e., how to use Evernote or how to be productive working at home). Do you have a hobby you can teach others about, such as watercolor painting for beginners or how to lower your score in golf? You don’t want to spend a lot of time creating a course that no one will buy. Many people might want to know about your topic, but the question is; are they willing to pay to learn it? Before you invest time in your course, research who the best buyer for it would be, and whether or not they’re ready, willing and able to buy it. If you’ve determined there is a market willing to buy your course, the next step is in determining what you’ll put in the course. By the nature of a course, the content you provide should go deep into the topic and cover all important aspects. A course isn’t like a blog post, which often just skims the surface. 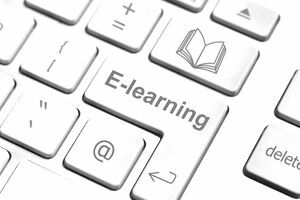 There is an expectation that online courses will offer a variety of teaching methods, such as text, video, worksheets, checklists, infographics, audio, and anything else that delivers information. The trick is in determining what format is best for what you’re trying to teach. In some cases, you might offer two methods for one lesson. For example, if you were teaching a course on how to use Quickbooks, you might have both a step-by-step text instruction and a video tutorial on how to install and set up the software. It is the most time-consuming aspect of creating an online course. Consider creating a logo or a color theme that appears in all lesson content. Proofread your text lessons and watch your videos to make sure there are no errors or glitches. For the most control, create a website to host and deliver your lesson. There are membership site scripts and WordPress plugins that can help you set up a system for selling and delivering your course. For faster, less technical effort, you can use an online course service, such as Udemy or SkillShare. Pay from these sites varies. For example, Udemy’s instructor pay depends on how the sale was generated (through its marketplace, an affiliate, or direct from you). The benefit to these resources is that you simply upload your course and the sites take care of selling it to their members/market, including payment processing. The downside is that they own the market and platform. Plus, you’re competing with other course providers, which can mean the need to reduce the price of your course to compete. A final option is a service such as Teachable or Ruzuku, both of which offer some of the benefits of self-hosted with the ease and speed of Udemy. These options have easy creation and upload like the course service marketplaces, but you can add your own domain, and customize your school like in self-hosted options. Some offer their resources for free, with more bells and whistles with paid plans. Most integrate with PayPal, or you can use their payment service. Most of the above options don’t require exclusivity so that you can sell your course on more than one platform. Even so, be sure to read the terms of service before offering your course on multiple platforms. Once you’ve picked your platform, upload your course. If the platform allows you to customize your course, such as adding a logo or color scheme, add them. It will help you create your unique brand. Regardless of your platform, you need to promote your course. Even using a service like Udemy, in which students can find you by perusing the Udemy marketplace, you want to do your own marketing. Start by creating a marketing plan that includes who your market is, where you can find them, and how you can entice them to check out your course. Great course marketing options include social media, PPC advertising, such as Facebook ads, and article marketing. There are many other free and low-cost marketing options as well. Every few months or so, check that your course information is current and relevant. Outdated information doesn’t help your students and can lead to bad reviews. Don’t forget to check and fix any broken links to resources. There’s no rule that you have to stick with one course. If there are other courses you can teach related to your initial course, create those. You can then refer your students to these other courses. For example, if you offer a course on how to write a mystery, you can add a course on how to publish a book and/or how to market a book. You can also create new courses in completely different areas. Creating and selling online courses can be quite lucrative if you’re able to provide a great course and reach your target marketing. Plus, with easier to use and more affordable resources to host your course, there’s no reason to avoid becoming an online instructor. While it can take time to create all the lessons in your course, once uploaded, it can become a profitable source of passive income to your existing business or as a business all on its own.